Vegetation, including shrubs and trees, can be a safety hazard when it’s allowed to grow too close to power lines. At ArborCare Tree Service, we offer Right of Way Maintenance services across Western Canada to ensure your property is clear of vegetation growth and debris that could be potentially harmful to your home or business. Sometimes vegetation just needs to be properly trimmed or pruned back so it doesn’t interfere with the right-of-way in the case of an emergency. Sometimes it’s better to completely remove the vegetation from the right-of-way altogether. When you call ArborCare Tree Service, one of our experienced arborists will come out to your property to examine the area and determine the amount of work that needs to be done. You can rest assured we will make professional recommendations that comply with all governmental regulations. Contact ArborCare Tree Service today to get started. 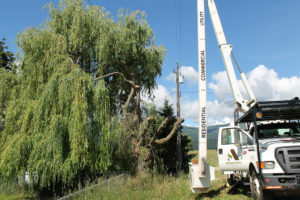 We offer free estimates for all your tree care service needs, including Right of Way Maintenance and Right of Way Vegetation Management, in Western Canada.